It seems that Fox wasn’t quite done when it announced its 2018 suspension lineup just a month ago. Turns out those sneaky Californians had another trick up their sleeves for the summer season. 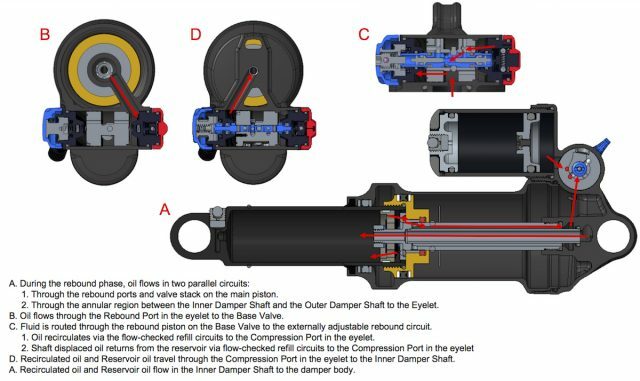 Adding to the existing line of rear shocks that includes the Float DPS, the Float X and the Float X2, is a brand new shock called the Float DPX2. Rolls off the tongue huh? In Fox’s words, the Float DPX2 “combines the best of X2 and DPS“. Internally, it looks to do exactly that. It’s an air shock built upon the popular Float DPS platform, and it’s specifically designed around the new EVOL air sleeve that features across the rest of the 2018 Fox line. Underneath that air can however, is a hybrid damping system that is completely unique to the DPX2 shock. 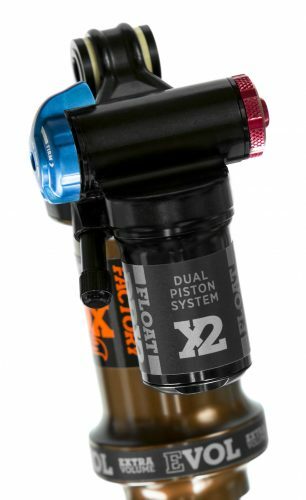 Using the Dual Piston System of the Float DPS shock, and the recirculating damper technology of the Float X2, the result (according to Foxy McFox Fox), is an air shock that provides more suppleness and better control. 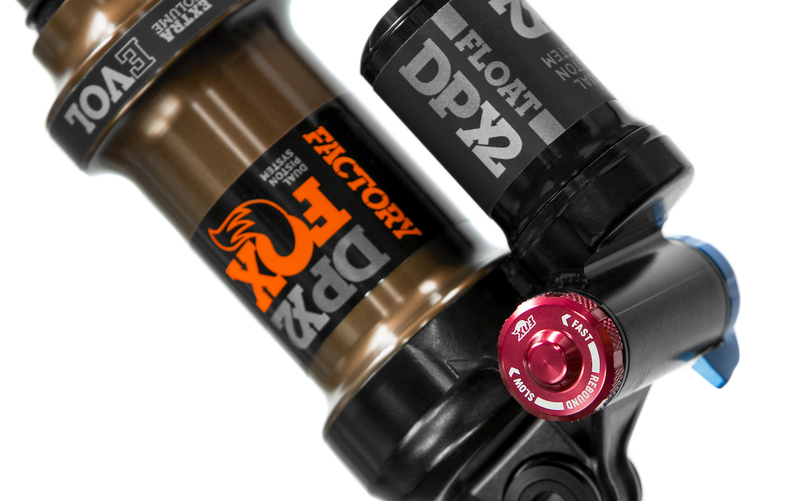 The new Float DPX2 shock combines the best of the Float DPS and X2 shocks. As you can probably gather, the Float DPX2 shock will replace the current Float X. As with its slim chassis, adjustable air spring and piggyback reservoir, the Float DPX2 shock appears to be targeting the same long travel trail and enduro bike market, and in particular, any rider who frequents high-altitude terrain. The DPX2 shock uses a piggyback reservoir and a hybrid damper system. The Float DPS will remain as a do-it-all shock for XC and trail bikes, while the Float X2 will remain as the go-to downhill air shock. For everything in between however, there’s this new shiny Float DPX2. So lets take a closer look at how it all works. The Base Valve is the barrel that sits on top of the piggyback chamber. 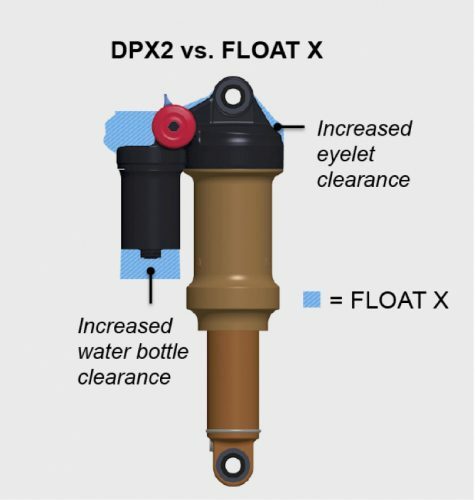 The main visual difference between the current Float X and the new Float DPX2 shock is inside the barrel-shaped base valve that sits perpendicular to the piggyback reservoir. On this base valve ‘barrel’, there’s a blue compression adjuster dial at one end, and a red rebound dial at the other. This is a massive improvement over the current Float X shock, which features a really awkward rebound adjuster that requires tools to access. Also improved is the schrader air valve, which pokes out further away from the air can, making it easier to access for when you need to adjust air pressures. The DPX2 combines the Dual Piston System of the DPS shock, with the recirculating oil circuit of the X2 shock. More oil flow for more control. 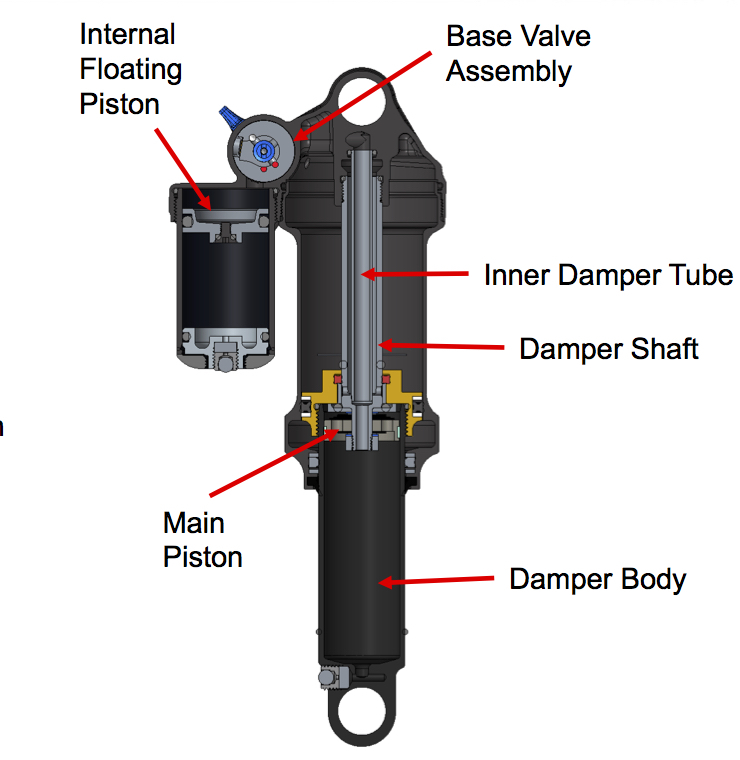 Situated between the top of the shock body and the piggyback reservoir, the Base Valve ‘barrel’ operates as a secondary damping circuit for the Float DPX2 shock. The Dual Piston System damper still sits inside the shock stanchion at the end of the damper shaft, but it’s bolstered by a recirculating oil path allows damping oil to also flow up around the damper shaft, through the Base Valve, and into the piggyback reservoir. With three different circuits inside for each compression setting (Open, Medium, Firm), the Base Valve utilises similar architecture as the Float X2 shock, but favours simpler adjustment rather than the independent high/low speed compression and rebound adjusters of the Float X2. However, the damping control from the recirculating circuit and Base Valve system is claimed to offer X2-like control, with an increase to small-bump sensitivity, more mid-stroke damping support, and completely decoupled rebound and compression settings. Want to see all the gubbins? Click on the below two images to see the compression circuit (photo 1) and the rebound circuit (photo 2). 1. Float DPX2 oil flow under compression. 2. Float DPX2 oil flow under rebound. EVOL air spring for a more linear spring feel and increased mid-stroke support. Ok, so now you know how it all works (or at least can pretend to like us…), we can move on. 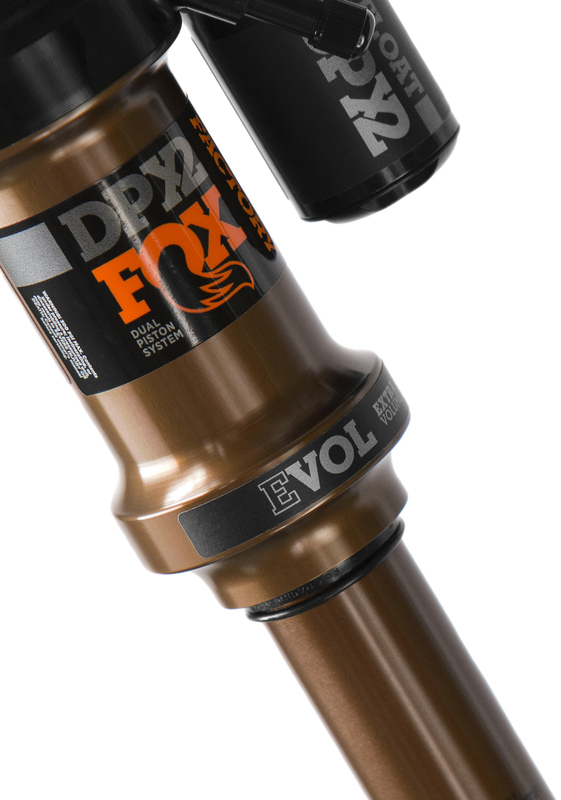 The Float DPX2 comes stock with the new EVOL air can that has featured on other 2018 Fox rear shocks. EVOL essentially stands for Expanded VOLume, and it refers to the expanded volume of the negative air chamber relative to the positive air chamber (the negative chamber is inside the bulgy bit at the base of the shock’s air can). 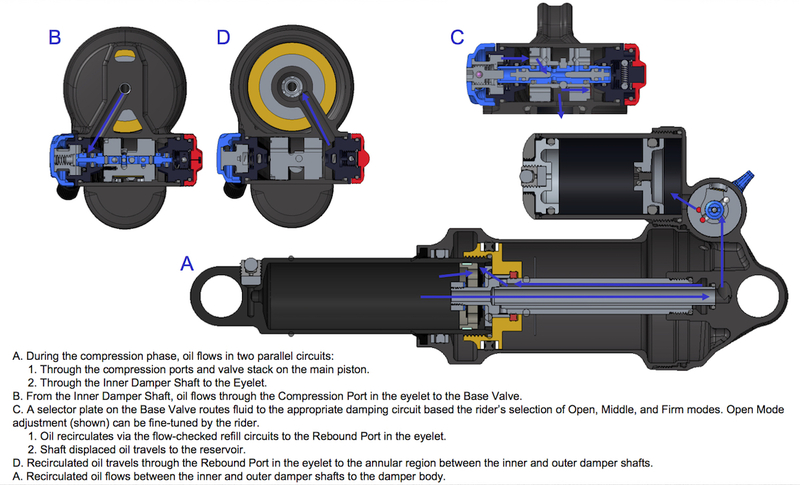 With a larger negative chamber, the rear shock ‘eases’ into its travel more readily, increasing small-bump compliance. For 2018, Fox has refined the EVOL air spring system, which it claims offers even better suppleness, and better mid-stroke support. With more user-friendly adjusters and a slimmer design, the Float DPX2 replaces the outgoing Float X shock. 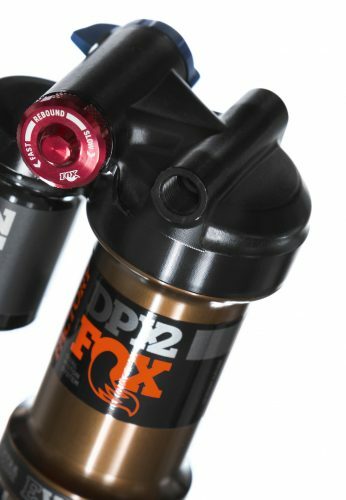 In addition to all the extra damping trickery going on inside the new Float DPX2 rear shock, Fox has somehow managed to slim down the body compared to the outgoing Float X rear shock. The piggyback chamber is shorter, which should increase frame and water bottle clearance for bike’s with minimal space inside the mainframe. The top of the shock eyelet has also been paired down, making it all look very neat and tidy indeed. Combined with the added ease of access to the rebound adjuster and schrader valve, it would appear to be thumbs-up all round. Double the damping power for double the performance? 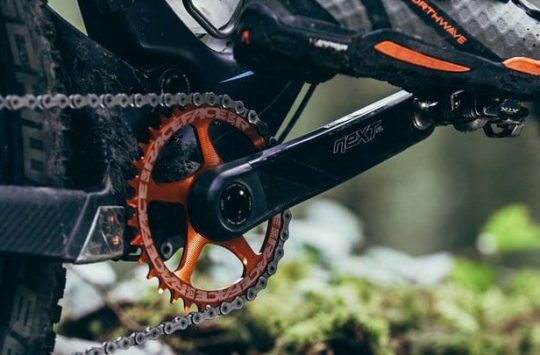 As to how the Float DPX2 shock performs on the trail? We’ll have one in for testing very soon, and will be sure to keep you updated with our thoughts once we’ve had some real-world trail time. 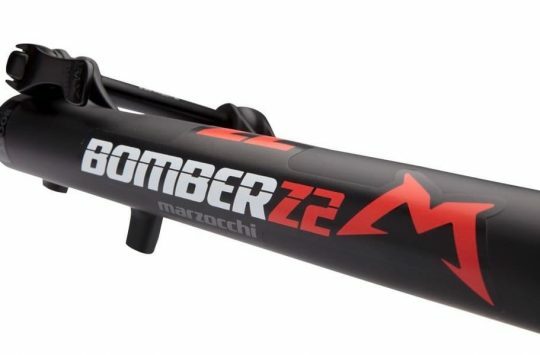 Marzocchi Re-launches the Bomber Z2 22 years after the original! 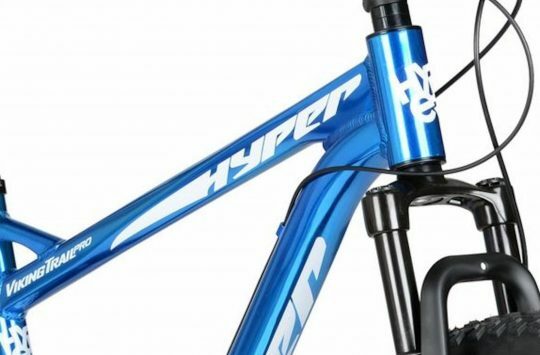 Update: UK pricing is confirmed at £589 for the new Float DPX2 shock. Very thorough piece Wil, but did I miss whether it comes in different tunes? I assume it must if it doesn’t have the adjustments of other twin-tube dampers? And can the negative air chamber be reduced if necessary, or is it just the positive chamber that accepts spacers? I’d assume so, given that both the Float DPS and Float X shocks are available with multiple factory tunes, but we’ve dropped a line to Fox to confirm that for you ASAP!